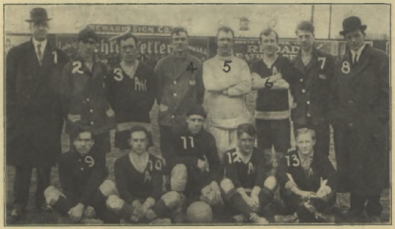 Our series looking at Philadelphia soccer happenings one hundred years ago continues. 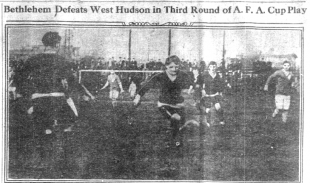 On a rainy Jan. 31, 1914, Bethlehem FC and Harrison, New Jersey’s West Hudson AA met at Tacony Ball Park at State Road and Unruh Street in what would be their fourth third round American Cup tie. 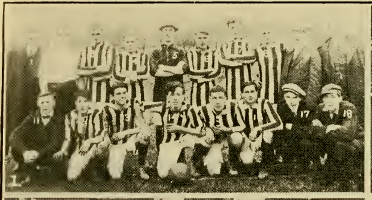 After their first meeting had ended in a 1-1 draw in front of 2000 spectators in Bethlehem on Dec. 27, 1913, the Steel Workers traveled to Harrison for the replay on Jan. 3, 1914, only for the game to be suspended due to poor weather late in the second half with score again tied at 1-1. When the teams met for the third replay in front of 2000 spectators at the Harrison Oval on Jan. 11, the game ended once more with the sides level at 1-1. Things got off to a poor start for the West Hudsons in the fourth replay when, as the Philadelphia Inquirer reported on Feb. 1, 1914, they arrived in Philadelphia shorthanded after two of their players had missed their train. This unfortunate turn of events saw a substitute player in goal with the regular starting goalkeeper moved to outside right to fill the attacking line — this in the days when every team played with four forwards — and the West Hudsons playing the entire 90 minutes with only ten men. 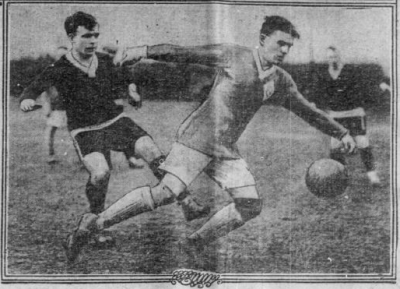 When the game did finally begin at 3:46 pm, the Inquirer reported that Bethlehem “played like demons in the first few minutes,” and, 12 minutes after the opening whistle, BFC center forward Donaghy scored. While Bethlehem “had all the better of the game for a time afterwards,” they were unable to capitalize on their numerical advantage and the West Hudsons equalized shortly before the end of the first half. Bethlehem inside right Lance in play at Tacony Ballpark against the West Hudsons. Five minutes after the restart of play, Bethlehem inside right Lance made it 2-1. Four minutes later, future National Soccer Hall of Famer Tommy Fleming made it 3-1. In the 69th minute, Fleming tallied again for the final goal of the contest and Bethlehem finished the game the 4-1 winners. 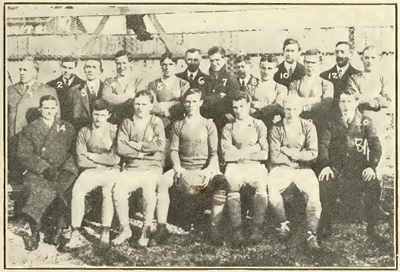 While the Globe reported, “For the most part, the game was cleanly played,” the Inquirer described, “As was to be expected, there was a great deal of roughness infused into the game and in consequence fouls were very frequent.” With some 18 minutes left in the match, Bethlehem right fullback McKelvie was sent off by the referee for deliberately kicking a West Hudson player, who was on the the ground, “in a delicate place,” so both teams finished the game with ten players. It would be neither the first time, nor last, that a soccer pundit was proved wrong. Poor weather the previous weekend had seen the cancellation of every local game in Philadelphia’s soccer leagues, with nearly an inch of rain falling on the area on Jan. 24, 1914. The weather wasn’t much better on Jan. 31, with more than half an inch of rain being recorded, but at least the high temperature for the day reached 64 degrees and the low never dropped below freezing. Still, the weather saw only four Allied Division games being played. In the second division, undefeated Putnam was handed a surprise in Chester, losing 6-4 to Linwood Hibernians. The Inquirer reported on Feb. 1, “The weather conditions were extremely bad and the shooting by both teams was surprisingly good taking everything into consideration.” Linwood center forward Hewitt finished the day with a hat trick. At Wilmington’s Shellpot Park, home side Windsors and the visiting Fairhill Wanderers each played a man down to a 1-1 draw. In third division play, Disston Reserves hosted Centenary. While the weather conditions “were anything but favorable for the playing of soccer,” both sides were at full strength for a 2-2 draw.